Marius and I was coming, on our Travel Tour 2006 with the ferry from Phi Phi Island. When we arrived we took a taxi from the pier to the On On Hotel in the center of Phuket Town which we found in our Lonely Planet Thailand travel book. The On On Hotel was coulisse for the movie “The Beach” with L. Di Caprio. This old Chinese guest house have a good choice of fan rooms with own and share bathrooms. We paid in 2006 300 Thai Baht for a room with a toilet per night. On the reception you can book tours and transport to many destinations in Thailand and southeast Asia. The most of the tourists who come here are coming for a day trip from the busy beaches of Phukets west coast. The public busses leaving from the Bus terminal in Phuket City to all touristic beaches on Thailands biggest island. The public bus to the International Airport on Phuket start here as well. The most tourists and backpacker come for shopping on the market or in the Robinson Ocean Plaza shopping mall. We stayed her two nights and was watching some sights. 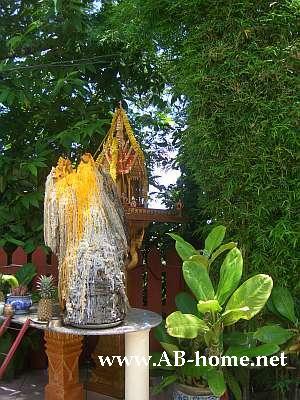 Close to the On On Hotel in Thailand is the Chinese Shrine of the Serene Light. It’s a small shrine with many flair. 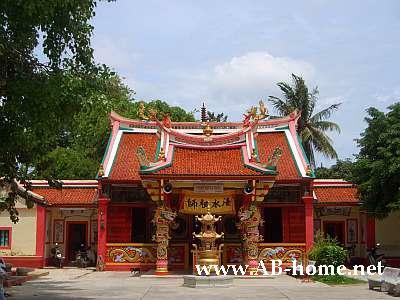 Like every Chinese temple this shrine in Phuket Town is decorated with many dragons and other holy statues. 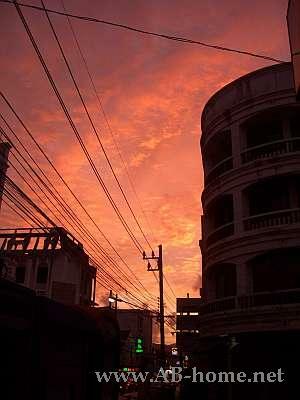 On our last day here at this city in southeast Asia we walked up to the top of a hill near the center of Phuket Town. From here we had a nice view over the city to the andaman sea. The Capital of the Thailands biggest city offer many posibilities for shopping, i can recoment a visit to this City in southeast Asia for all people who are bored of the buisy beaches on the west side of this island. The Center have many point of interesting and beautiful Chinese Temples. The posibilities for dinner and activities are nearly endless over here compared to other cities in Thailand. For all backpackers and travelers who stay on the island it´s a good stop to relax from the trouble on the rest of Phuket in the Andaman Sea.